While very few of us will be doing projects that require measurements down to the 100ths of an inch, a set of cheap value priced calipers is something I think everyone should have. I got the set pictured at (I think) Harbor Freight for less that $5. Amazon sells them as well, a 3 pack for less than $12. I would stay away from the ones with the dial or digital readout, unless you know far more about them than I am covering in this post. The ones that are just a one piece sliding on another have nothing that can go wrong, other than physically breaking or the markings wearing off. 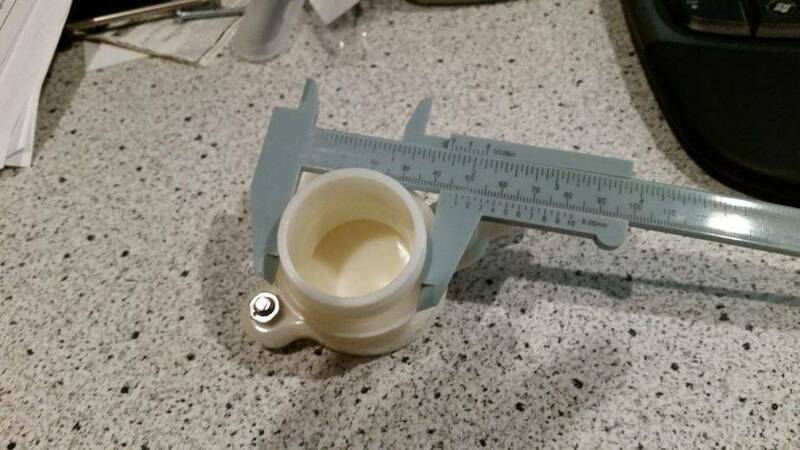 These will measure inside diameter, outside diameter and depth. In this example I need to know what size hole saw to use to mount this gate valve in a bucket that will hold honey. It is maybe 1/64″ of an inch smaller than 1-3/4″, so I will be using a 1-3/4″ hole saw and let the gasket take care of the rest. When it comes to making large diameter holes something called a hole saw is the way to go. Note that this is not fine woodworking as it can leave a bit of tearout. However if you are doing something more utilitarian or in construction it works great. I’m not really a fan of buying a set as you need to buy the sizes you need based on the projects you are doing. I’ve found the Milwaukee brand that I get from Home Depot to be a great value. You buy one center and then buy the sizes you need as you go along. Warning the larger ones are not cheep, I’ve got more than $100 into my collection, but that expense was spread out over time. A word of warning, you do need a big drill to run the larger ones and if they catch in the wood it can surprise you and maybe hurt your wrist. 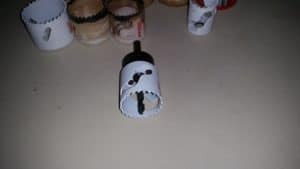 I was drilling holes for 3″ drain pipe in new construction and the saw caught spinning the drill which had a side handle. That handle slammed into a stud hard to break the handle off. Unfortunately my hand was caught between that handle and the stud and it really hurt. I suspect I may have fractured one of the bones in the back of my hand and I’ve heard stories of people spraining or breaking their wrist, so caution is in order. Also NEVER use a trigger lock to keep the drill on. 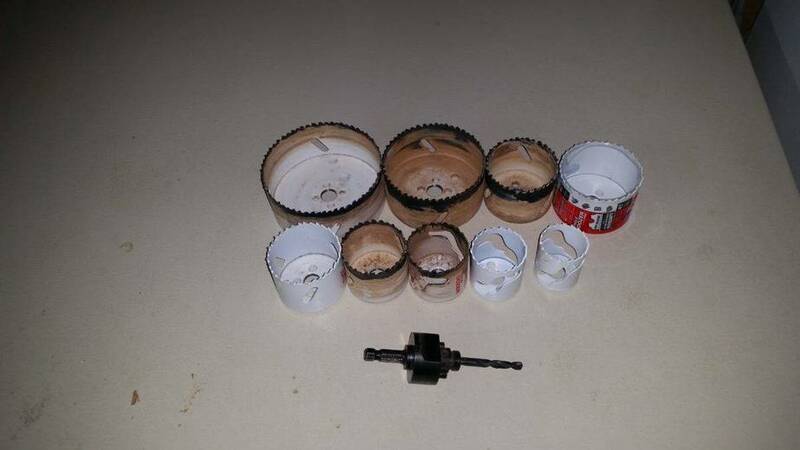 These also work particularly well on plastic buckets and barrels for projects that involve putting in valves. It is important to drill the hole the right size the first time as it is difficult to come back and re-drill the hole to a larger size. If you find yourself needing to re-drill you will have to put something in the hole for the center guide drill. One of the jobs on a ranch is to mend fences. Years ago this meant getting on a horse and riding the fence line and making any needed repairs. You couldn’t carry a lot of tools with you so the fencing tool pictured above was developed. Now I think fence repair is done from something like a ATV of some kind so more tools can be carried. However don’t discount the usefulness of this tool in dealing with anything fence or wire related. 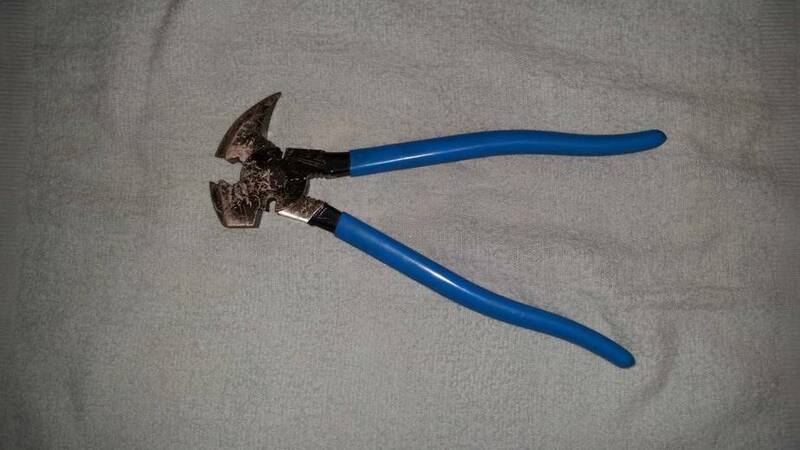 I find it is my go-to tool in dealing with my chicken coop. It has a hammer to drive staples, a tooth to pull them out, you can cut wire with it and bend/tighten wire into the shape you want it. I have always been cautions of “all in one” tools and generally I find they do not do any job well. While I would not want to spend hours pounding in staples with this tool, I feel it works exceptionally for the job it was designed to do, repairing anything with wire. So while most of us will not be working on a large ranch spending the day working on fencing, I recommend this tool for anyone trying to build a small homestead. A word of caution, I first had a cheap one and the end of the tooth broke off. I have since got a version by Channellock and it has held up well. First of all everyone should own at least one hammer and if you are only going to own one hammer I recommend the Estwing 20 oz Ripping Hammer. I’ve had this hammer for probably 30 years and while I didn’t use it daily like a carpenter would, I have used (and abused) it for a long time and it still is in good shape. This weight balances something heavy enough when you need some force, but still light enough for the average user to control. 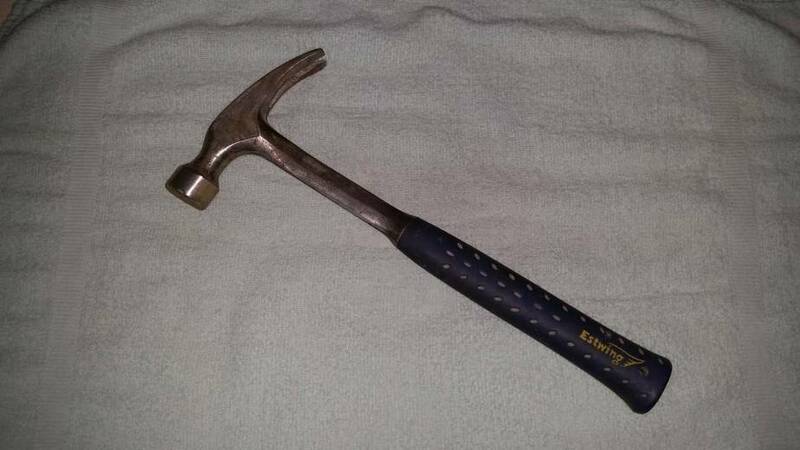 This hammer is available from many local store as well as Amazon Prime for less than $30. If you don’t already have something like this then is an excellent place to start and as long as you don’t lose it you will find you can pass it on to a grand-kid. Don’t get drawn into lots of fancy “features”, the basic hammer is what you really need. If you do a lot rough framing some of those feature you might find useful, but if you know that you are way beyond this recommendation. Really be careful of a hammer with a cross-hatch pattern on it, you miss what you are aiming for and catch your thumb it will really hurt and you likely lose your nail as well.